Roeslein’s team focused on providing a way for Dana to take information provided by its machines and display it in a manner that improved performance of Dana’s workforce and also discovered production line problem areas to help meet the requirements of Dana’s Industry 4.0 Initiative. Roeslein developed an adaptable and flexible Ignition project by which each plant, no matter how different, could use the same data as the other plants. 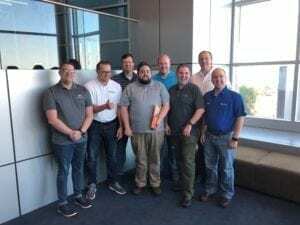 Matt Townsend, Advanced Manufacturing Engineering Lead at Dana explained, “We are using Ignition as our MES (manufacturing execution system) solution on the shop floor. Not only are we using it for SCADA, we are pulling tag information and feeding other portions of our ecosystem to supply in process real time data”. Dana floor employees can now see how they are doing within their shift, as well as how other shifts did before them. This led to a push by each shift to outperform the last. This newfound working culture has contributed to increased Dana production. In addition and with the help of the Ignition project, Dana can identify improvement areas within its plant by analyzing OEE values, downtime occurrences, and durations along with per-machine production. Dana is a world leader in highly engineered solutions for improving the efficiencies, performance, and sustainability of powered vehicles and machinery. Dana supports the passenger vehicle, commercial truck, and off-highway markets, as well as industrial and stationary equipment applications. Founded in 1904 and based in Maumee, Ohio, the company employs 30,000 people in 33 countries on six continents. Read the full case study here and be sure to check out the project overview video.